It has been brought to the attention of the ROA that it will be 100 years since the sinking of the Cunard vessel RMS Lusitania ~ MFA on the 7th May 1915 off the Old Head of Kinsale Ireland. 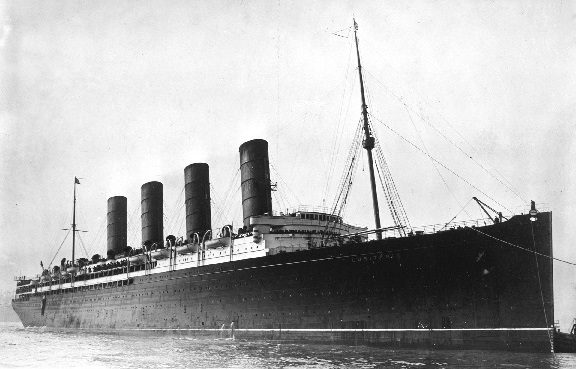 RMS Lusitania was bound from New York to her port of registry Liverpool, which would be an ideal location to set up a GB Amateur Radio Station for the month of May 2015 With this in mind it would be possible to obtain the amateur call sign GB100MFA for the occasion via Ofcom, although this can take time and require additional paper work. Hopefully a second station can be arranged in Ireland with the call sign EI100MFA to run in conjunction with the GB station during the month. Due to the limited time frame action needs to be taken as soon as possible. Several locations are being investigated, however, failing to obtain use of these we would then be looking for a suitable building or amateur club house in the Liverpool area. If any ROAR members, who would be interested in helping to get this event off the ground could you please indicate by contacting either Dave Ellis, Geoff Valentine or Tom Fawley. GB100ZZ which was organised and run by member David Barlow was a great success, and the ROA benefited by the TV and Newspaper coverage which in turn brought in numerous new members. With that in mind, the media coverage the Special Event station GB100MFA, would bring to the ROA from this once great port makes it all the more worthwhile in attaining. We have confirmation that the event is to run from 1st ~ 31st May 2015 on the Planet Light Vessel in Canning Dock Liverpool. We are in the process of organising a visit to the vessel and meet up with the owner and ROA members who have helped to set up this QTH for the event. I have also been offered a back up QTH if the Planet falls through for any reason. We are hoping to have two stations running, there is already a permanent one on-board GB2LVL, and room for a second. The event will be ALL BAND and a mixture of CW/SSB to give everybody a chance of a QSO. There will be a page set up on the web site with news updates as and when received – if any ROA amateurs are willing to operate there will be a roster produced, but this is dependent upon operating times available which we are hoping to formulate when we meet up in Liverpool. Will they be covering all bands or just OARS 40m??? The NoV licence GB100MFA has been issued and will run from the 1st~31st May 2015.
and will in due course put out a request for members who are willing to operate. The ROARS committee are working on this. Watch this space!